Egyptian activists are organising a series of events building resistance to the anti-protest law and solidarity with the detainees. 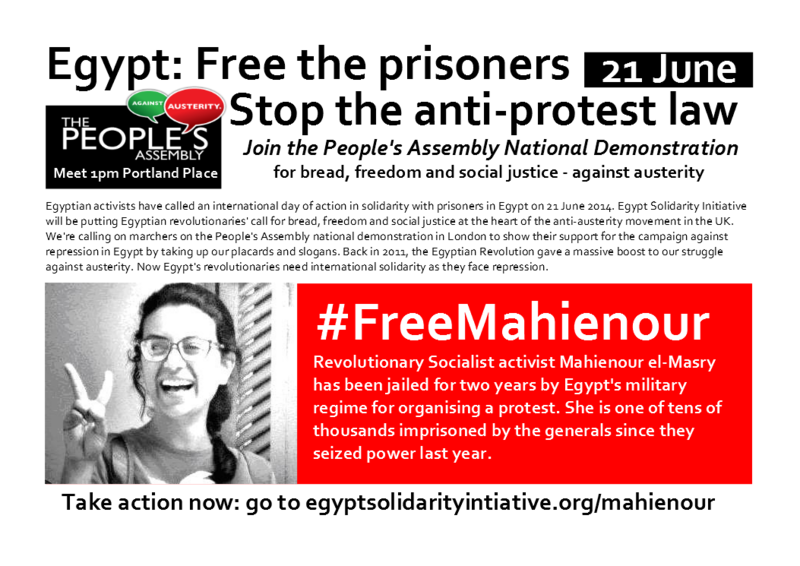 They are calling for activists around the world to make 21 June a day of action and protest calilng for the release of prisoners like Mahienour el-Masry, Mohamed Soltan, and Alaa Abdel Fattah. Events are being planned in Paris, Berlin, the USA and London, Athens, Derry and Stockholm. Egypt Solidarity Initiative will be taking this call to the tens of thousands of trade unionists and activists expected to march on the People’s Assembly national demonstration against austerity. We want to make sure that the Egypt revolution’s slogan of ‘bread, freedom and social justice’ is at the heart of the demonstration. We’ll be calling on the marchers to show their support for Egyptian activists facing repression by taking up our placards and slogans and joining our contingent at the start of the march in Portland Place, outside the BBC, at 1pm.